- the picture is first recorded in the sale of the collection of Emil Goldschmidt (1848-1909), Frankfurt, at Rudolph Lepke, Berlin, on 27 April 1909 (48), clearly identified through the photograph in the sale catalogue. - the purchaser at the 1909 sale was an art dealer who has not been identified. - this may be the painting by Lucas Cranach of 'Venus und Amor als Honigdieb', of similar but not identical dimensions, that was recorded as being sold by the widow of the Chemnitz businessman Hans Hermann Vogel (1867-after 1931) through Heinemann in Munich on 12 September 1935 to 'Allmer, Berlin'. The latter can possibly be identified as Robert Allmers (1872-1951), president of the German Automobile Industry Association. - it was acquired by Adolf Hitler (1889-1945) at an unknown date and is recorded in a photograph in an album that includes works from his private collection displayed at the Berghof, Berchtesgarten, Obersalzberg. Hitler was said in 1947 to have had a painting by Cranach of `Venus and Amor' in the flat in Munich in which he lived from 1929 onwards. The painting may have been the work acquired by him in or before 1937, when he is said to have owned a recently acquired but unspecified work by Cranach. It may be the painting by Cranach that he is said to have acquired with royalties from the sales of 'Mein Kampf'. - the painting was owned from 1945 by Mrs Patricia Lochridge Hartwell (1916-1998), an American war correspondent who was permitted to select it from a warehouse controlled by American forces in southern Germany in 1945. - according to Silberman it was sold `by family descendents' of the purchasers at the 1909 sale (see above). - it was bought by the National Gallery from Silberman in 1963. The painting was no. 48 (p. 26) in the catalogue of the sale through Rudolph Lepke, Berlin, of the Sammlung aus dem Nachlass Emil Goldschmidt, Frankfurt am Main, Tuesday 27 April 1909. The `Venus und Amor' by Lucas Cranach was described as `Im Vordergrunde einer Landschaft mit waldigem Dickicht Venus in prächtigem altdeutschen Federhut unter einem fruchtbeladenen Apfelbaum Amor, der eine Honigwabe entwendet hat, beklagt sich bei seiner göttlichen Mutter über die Stiche der Bienen. Im Walde Hirsch und Hirschkuh, rechts im Hintergrunde Wasser mit Felsinsel. Auf Holz. Rechts oben vierzeiliger, auf die Darstellung bezüglicher lateinischer Vers. Auf einem Stein unten der Cranach Drache. H.82cm. B.55 cm. G.-R. (Abbildung auf Taf. 4.) (http://digi.ub.uni-heidelberg.de/diglit/lepke1909_04_27/0032). According to the sale catalogue (p. 3), Emil Goldschmidt (b. 1848) had recently died at a relatively young age, soon after his father Salamon Benedikt Goldschmidt of Frankfurt (1818-1906) (whose art collection had been sold in Vienna on 11 March 1907), and had amassed a substantial collection of old master paintings. Most of his paintings had been obtained in Holland (the collection included a large number of Dutch paintings) and in Vienna. On p. 4 is noted `Ein Meisterstück aus Cranachs mittlerer Zeit (von 1525 etwa) ist die graziös bewegte Venus (Nr. 48)'. In the record of the sale in Blätter fur Gemaldekunde (1909), p. 74, it is recorded that the painting was sold for 13,000 Marks and that the buyer was an art dealer (Kh); I am grateful to Nancy Yeide for this reference. Panel, 83.0 x 56.5 cm, Heinemann no. 19262, sold by Frau Vogel of Chemnitz for 20,000 Marks; bought by Allmer for 32,000 Marks: http://heinemann.gnm.de/de/kunstwerk-2334.htm. I am grateful to Eyal Dolev for this suggestion. Of known versions, the dimensions of NG 6344 are similar only to the painting then and now at Schwerin, which measures 83.0 x 58.2 cm, and is therefore slightly broader than NG 6344 and the Vogel painting; NG 6344 is slightly smaller than the Vogel painting. By Heinrich Hoffmann on 3 September 1947. Interrogation of Hoffmann 29 August 1947: `Hitler had the following works of art in his apartment in Grillparzerstrasse 8. Cranach 'Venus and Amor'': see NARA RG 260, M1946, Restitution Research Records 1945-50, Roll 0136, Blatt 128 (photo of document kindly supplied by Eyal Dolev). 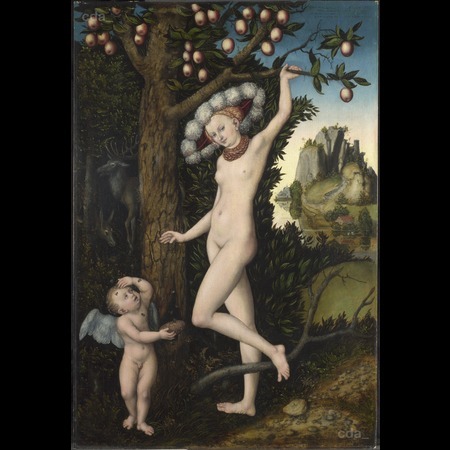 A painting by Cranach listed by the Central Collecting Point as `Eva, den Paradiesapfel pflückend' evidently refers to the same work: Venus in NG 6344 is depicted making a similar gesture to Eve in other works by Cranach, see further below and Schwarz 2009, p. 110. Ward Price 1937, p. 20: `He recently acquired a Cranach and two Brueghels for his Munich flat' and ibid., p. 27: `The principal living room is long and new. The walls are hung with a display of pictures 'In addition to a fifteenth-century Cranach '' . According to Heinrich Hoffmann's memoirs: information kindly supplied by Anne Webber. Although Gauleiter Fritz Sauckel is recorded as having given Hitler a `naked Venus by Lucas Cranach the Elder' for his fiftieth birthday on 20 April 1939, this was the painting formerly in the Schlossmuseum, Weimar (see Versions, no. 3, below) and not NG 6344. See Bernhard 1965, p. 176: `Gauleiter Sauckel schenkte Hitler zu seinem 50. Geburtstag am 20.4.1939, Lucas Cranach d. Ä. 'Nackte Venus aus Weimar''. Gerhard Keiderling noted in Keiderling 2005, p. 38, that Sauckel sought gifts for Hitler and that a Venus in a landscape by Cranach the Elder was supplied by the Weimar museum director Dr Walter Scheidig against a receipt (reference kindly supplied by Eyal Dolev). 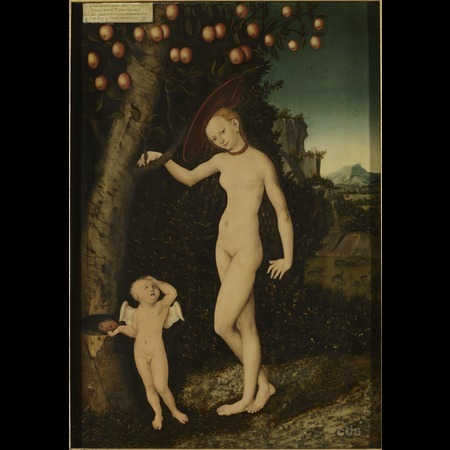 A Venus and Cupid by Cranach from Weimar, measuring 50.0 x 35.0 cm, was taken by US troops from the repository at Schwarzburg: see Petropolous 1996, pp. 179-80. Information provided by her son, Professor Jay Hartwell, in 2004. Patricia Lochridge recorded her experience as US commander for a day at Berchtesgaden in `I governed Berchtesgaden', Woman's Home Companion, August 1945, pp. 4-5; see also ibid., `I'll never forget', September 1945, pp. 4-5. I am grateful to Martin Bailey for this information. According to Silberman, Gallery correspondence. It is possible that information concerning the previous ownership of the painting was present on the reverse of the panel, which was transferred to the present support in 1963 at the time of the sale: see Gallery correspondence between Michael Levey and Abris Silberman. The painting was offered to the Metropolitan Museum, New York, in 1962 as the property of Mr and Mrs Dickson Hartwell of New York (Mrs Patricia Hartwell then worked for UNICEF): information obtained from correspondence with the Metropolitan Museum in 1999 in Gallery files; copies of 1962 correspondence between the Museum and the Hartwells in Gallery files. [Susan Foister, `Lucas Cranach the Elder, Cupid complaining to Venus' published online 2015, from 'The German Paintings before 1800', London: forthcoming. Title A textual source for Cranach's "Venus with Cupid the honey-thief"
The current support is Masonite, which has been veneered and cradled to look like an old panel. 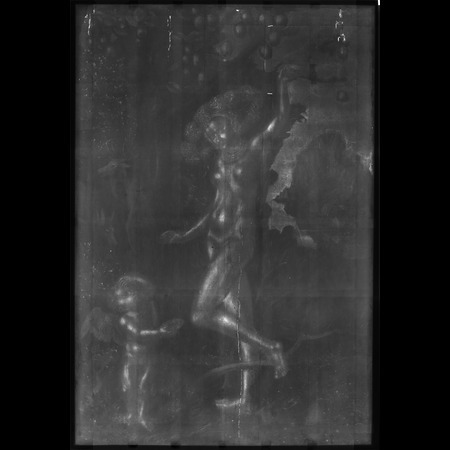 The pattern of paint loss visible in a photograph taken after cleaning but before restoration in 1963 suggests that the original support was a panel with vertical grain, and with a vertical join just to the right of Venus’s body, extending through her raised arm and her leg; there was also a split or join to the left of Venus’s head, in the tree. The ground is calcium carbonate (chalk) bound with animal glue. A fine canvas is present beneath the ground but this has been identified as cotton and was presumably added as part of the transfer process. Paint samples taken in 1963 showed that there is a lead white priming on top of the ground. Nothing that could definitely be identified as black underdrawing could be found with infrared reflectography. Examination of the surface with a microscope, however, revealed lines of red pigment below the uppermost layers of paint. These red lines appear to be performing the role of underdrawing and must lie over the priming. It has not been possible to identify the red material used, but it appears to be in a liquid medium. The lines can only be seen where the paint over them is pale in colour and thinly applied. They have been found in the hat, along several contours of the figures and in the landscape. Linseed oil was identified by GC analysis of three samples: mid-blue paint from the sky, green from a leaf on the tree and creamy white paint from the clouds. There was no indication of heat-prepolymerisation of the medium. The blue sky is painted in two layers of azurite mixed with a little lead white, the blue pigment being more finely ground in the lower layer. Cross-sections show that in some places the leaves of the apple tree have a black underpaint; they are modelled with an opaque yellow-green paint consisting of lead-tin yellow and verdigris in the lighter areas, and a darker green of verdigris alone in the shadows. The apples are painted with a mixture of lead white with some red lake and vermilion, glazed with red lake in the rosiest parts; the yellow highlights are of lead-tin yellow. The apples have reserves but many of the leaves are painted over the sky. A cross-section of paint from an apple showed a very thin scattering of carbon black particles over the lead white priming and under the layer of pink: on the painting, under magnification, this can be seen to be a very thin black underpainting, as though a very little paint has been dragged over the surface. There are numerous small pentimenti with the black underpainting for leaves or parts of leaves being painted out with blue sky paint. Similar thin layers of black are present under the small mountain and the grass in the middle distance. [Susan Foister, ‘Lucas Cranach the Elder, Cupid complaining to Venus' published online 2015, from 'The German Paintings before 1800', London: forthcoming. An underdrawing is not readily visible.Some red linesare visible under the stereomicroscope and may indicate the use of red chalk or a similar red medium for the initial design. Mid-blue paint, LH edge, towards top. GC analysis would seem to indicate that the paint binder within this sample is composed of linseed oil. There was no suggestion that the oil had been pre-polymerised. No resin was found, within the limits of GC analysis. Green paint of leaves, upper LH edge. Although there was the possibility that this area might contain a browned copper resinate, this seems unlikely as GC analysis gave an indication of the use of linseed oil alone. Linseed oil was detected as binder by GC analysis. It dad not appear to have undergone heat pre-polymerisation and no addition of natural resin was apparent. Samples taken and examined by Joyce Plesters June 1963. See full report by Joyce Plesters and her drawings of the cross-sections. Sample location: top right, near top most dappled leaf, right-hand corner. Sample location: left-hand side, from slight dent in surface, above stag's antlers. Sample location: top right-hand corner, from edge of long streak of damage. Sample location: top left-hand corner.